The rucomfy Dogtuff Pet Bed is made from a super strong durable material, which has the added strength from the PVC backing on the material. The 'Tuffer' pet bed is also made in a way to reduce the sewing seams visible to your dog. Meaning, that it is certainly tough enough to withstand the most boisterous dog! The rucomfy Dogtuff Pet Bed is 100% waterproof and extremely easy to clean. The fabric is odour, dirt, mite, hair and UV resistant. The Bed is generously filled with memory foam crumb filling, which contours to your pets shape providing them with ultimate support and reduces the pressure on their joints meaning the can sleep in complete comfort. You can use the Dogtuff Pet Bed anywhere: indoors, outdoors, on the move in the car or even take it on a family holiday! The cover is made from a woven Polyester meaning it is safe and extremely comfortable for your pet! 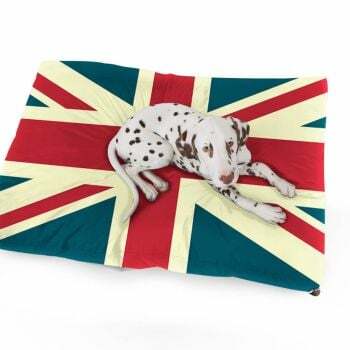 It is available in a great range of colours and sizes, meaning you will find one that suits not only your pet but your home as well. For the dog to sleep on. Might have gone for the bean bag instead of a foam filled bag. Great for my boxers, good quality and mischief proof. Dogs love it, so thanks, highly recommended. Very durable for my dog. We use it in the house, in the yard and also from time to time in the car. Quality as described but we would not reccomend as rather too tough and cold. Excellent quality and a must for anyone who has pets and wants an easy clean product. This is a brilliant, very tough dog bed and I love the fact that it can be hosed down in the garden. Great dog bed. Really sturdy and hardwearing. Brought this for a new puppy and he seems to love it-fits very nicely in his crate. Lovely dog bed very well made. This item is great, I have a large dog and it was hard to find a bed big enough! This suits him perfectly! The bed is easy clean, you can literally wipe it, you don't even need to put it in the washing machine. The bed is really comfortable and my pooch loves it. My dog likes to chew and has already chewed the zip area slightly.